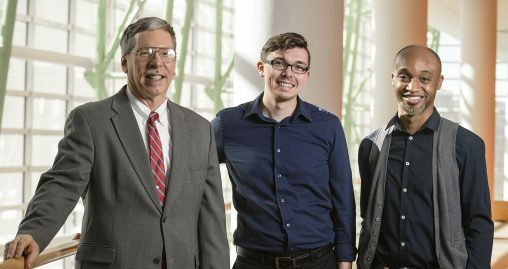 Internships turned out to be the magic formula for two recent Wright State University arts graduates, enabling them to land full-time jobs with the Dayton Ballet and Dayton Philharmonic Orchestra. Cory Wilhite, who graduated last year with a bachelor’s degree in music education and a certificate in arts management, is now artistic administrator for the ballet. And James Edwards-Kenion, who recently earned his master’s degree in bassoon performance, is orchestra production manager for the philharmonic. Edwards-Kenion landed his internship through a referral from the Victoria Theatre Association. Wilhite got his through Wright State’s Collaborative Education, Leadership and Innovation in the Arts (CELIA) Arts Management Certificate internship partnership launched last year between Wright State and the Dayton Performing Arts Alliance, which includes the ballet, philharmonic and Dayton Opera. “I don’t know too many people who can come out of an internship and say, ‘I now have orchestra, opera and ballet experience along with marketing and development and everything else,’” said Wilhite. Edwards-Kenion grew up in Dayton, attending Belle Haven Elementary School, where both of his parents taught. He began taking piano lessons when he was 5 years old along with his brother. “My Mom said, ‘As long as you guys finish piano through high school, you can do whatever you want to do after that,’” Edwards-Kenion recalled. He studied piano and orchestra at Stivers School for the Arts and played the organ at church. At Wright State, he majored in bassoon performance earning his bachelor’s degree in 2014 and his master’s a few years later. Edwards-Kenion started his internship with the Dayton Performing Arts Alliance on Oct. 8 and was quickly offered a full-time job with the philharmonic orchestra, starting Oct. 29. He arranges logistics for the performers, supports the stagehands and handles a number of other duties. He said the internship enabled him to make that critical connection. “For me, it was just being in the right place at the right time,” he said. Wilhite said his internship with the arts alliance was instrumental in getting the job with the ballet. Wilhite said it was “phenomenal” to get a full-time job with the ballet and already know a majority of the employees. “I came in knowing what everybody did and who to go to immediately,” he said. Wilhite is responsible for everything from getting contracts filled out to making sure there are an adequate number of stagehands for performances to ensuring that all of the necessary equipment is either purchased or brought in from the warehouse. Strohecker said the internship program gave him a chance to get to know Wilhite and Edwards-Kenion. “We had this history already of how they performed with us, and it just made the decision a whole lot easier,” he said. Strohecker grew up in the Columbus area, started playing the tuba in high school and earned his bachelor’s degree in tuba performance at Indiana University. After graduating in 1983, he joined the Air Force and played in the Air Force Band, traveling the world and performing for dignitaries such as Presidents Ronald Reagan and George H.W. Bush. After wrapping up his Air Force career at Wright-Patterson Air Force Base in 2014, Strohecker earned his Master of Business Administration from Wright State. He began working for the philharmonic in 2016. Strohecker’s job is to make sure that the symphony, the ballet and the opera have the resources, personnel and rehearsal space they need and that nothing conflicts.